Girls only and Coed STEM camps with hands-on projects to rising 1st-6th graders. Join us for our 5th summer of fun! From the moment our club members arrive, they are surrounded by successful, smart, trailblazing role models who encourage them to pursue their love of science, exploration and building. We create a nurturing environment that focuses on building community with plenty of recess time for active bodies. Learn more about our day. Chemistry is the science that studies the foundations of our world. Investigating substances and the ways in which they interact, combine, and change can be magical. Through lots of accessible hands-on projects and creations, kids will explore this wonderfully fun, surprising, and engaging science, Renegade style. Fizzle, ooze, and transform with us this summer. This camp has no screen time. Let’s go fly a kite! Or reach for the stars and explore how to get up in the air. Lift, wings, propulsion… adventure into the skies for a fun look at the principles of flight. Renegades will spend the week launching their imaginations into the stratosphere by making a variety of flying machines and exploring the concept of aeronautics. This camp has no screen time. Writing for Makers. Communicating ideas effectively is incredibly important for innovators, but sometimes our kids’ creativity outpaces their ability to use a pencil. Amazing story ideas can get lost when kids get overwhelmed and never fully realize their vision. This camp blends aspects of book writing, film, theater, graphic novels, and making to motivate young storytellers through the often daunting tasks of physical writing. Playing with your STEAM. Imaginations run wild as campers make toys, then play with them! From spinning tops to puzzle toys to creating and sharing their own board games complete with rules and goals, campers will discover what makes a toy fun, and use critical thinking to evaluate what “fun” means. Compare different kinds of play, does everyone have the same taste in toys? Find out! 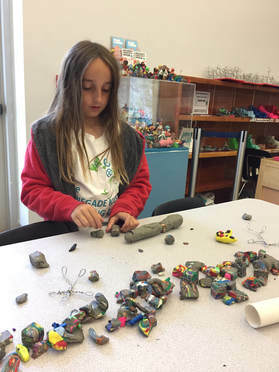 Campers explore shape, structure, and design in this class focusing on the science behind toys.​ Our Renegade Teachers will guide Renegades as they explore, experiment, create and complete camp projects on their own. This camp has no screen time.